Technology is helping people achieve sustainable and normal blood glucose levels, reducing the threat of complications, but is technology out of reach for too many? CGMs help correct high BGs more safely. For decades, the medical community believed if a person with type 1 diabetes had injectable insulin, a blood glucose meter, a healthy diet, a responsive and caring medical team, then that individual had all the tools necessary to achieve normal blood glucose (BG). However, research and scientific data tell us that it’s just not enough. Without knowing the unpredictable variability of BG nor having the ability to remedy poor results immediately, outcomes can be shatteringly unexpected and frightening. Complications can include organ damage, fatal hypoglycaemia or DKA. Without access to advanced technology, like Continuous Glucose Monitoring (CGM), intensive insulin therapy for diabetes management is rarely proactive and after the required diagnostic HbA1c test, painfully reactive to a target hard to achieve (<7%). Thanks to advanced technology, diabetes self-management is improving. CGMs are sensing and wireless tools that can tell if BG is stable, rising or decreasing and at what speed. With a touch of a button, insulin pumps can infuse rapid insulin at as little as .025 units per hour. Alerts can be set to warn before a hypoglycaemic episode occurs and before extreme highs. Technology is helping people achieve sustainable and normal blood glucose levels, reducing the threat of complications, but is technology out of reach for too many? Medtronic Minimed (worth about 1.9 billion US dollars) is first to the diabetes care market with a hybrid closed-loop (HCL) system, also known as an artificial pancreas (AP), for management of type 1 diabetes, seven years and up. 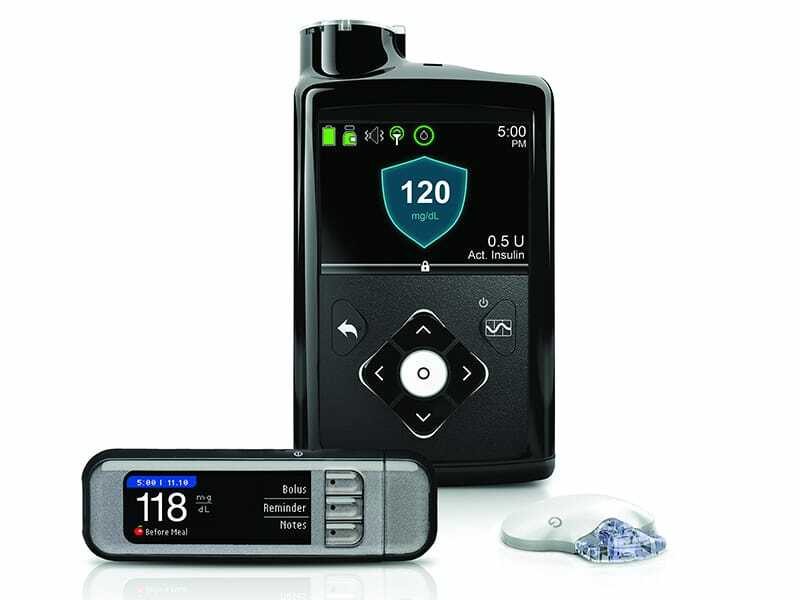 The Minimed 670G uses technology fully integrated with a CGM, and a BG meter. When the user puts it in auto mode, it is able to decrease or stop insulin delivery when it detects glucose is low, or increase insulin delivery when glucose levels are high—similar but not quite as robust as a human pancreas. Users must still manually bolus and calibrate with finger sticks. Alejandro Galindo, President of Advanced Insulin Management for Medtronic Diabetes, has worked with thousands of people with diabetes worldwide and has seen technology’s impact. He believes the future is sensor-augmented technology because it offers people with diabetes and their providers a more advanced way of managing diabetes. “In my view, we are effectively giving a patient a system that acts as if that patient has a healthy pancreas. Through automation we have a real shot of normal blood glucose where there is no mental burden, and an optimal wear experience. Until there is a cure we want to ensure a person with type 1 diabetes has a normal life,” says Galindo. 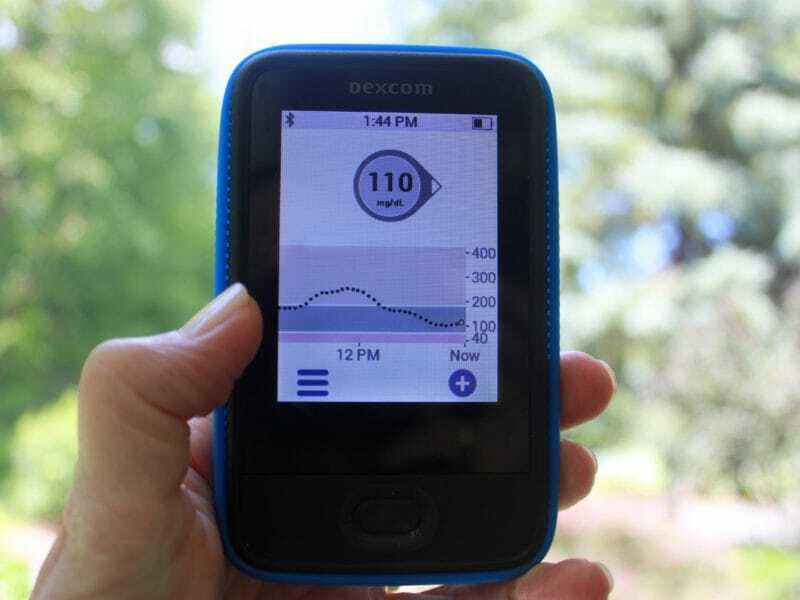 The other big news for diabetes device technology is the approval of the Dexcom G6 iCGM which received earlier than expected FDA approval in March 2018. Most compelling about the FDA decision for this device is an overarching mandate that gives all current and future iCGM systems moderate-risk class II device status versus high-risk classification, helping to bring more competition and innovation more quickly to people with diabetes. Dexcom’s G6 can be used by children and adults two years and up, can be worn for 10 days, requires no finger-sticks for calibration on treatment decisions and integration is approved for use with other devices. Unsurprisingly, CGM is changing established reliance on the HbA1c. In November 2017, nationally recognized diabetes organizations issued a joint consensus statement to standardize definitions for clinically meaningful outcome measures beyond HbA1c for individuals with type 1 diabetes. CGMs provide the means to document hypoglycemia and time in range (percentage of readings 70–180 mg/dL (3.9–10.0 mmol/L)) and the ability to see trends and make dosing changes when called for at mealtimes, during exercise and even for stress. Jason Baker is an endocrinologist at Weill Cornell in New York, USA and founder of Marjorie’s Fund. He also lives with type 1 diabetes and oversees diabetes care for about 2000 people with either type 1 or type 2 diabetes. He believes in the power of CGM. 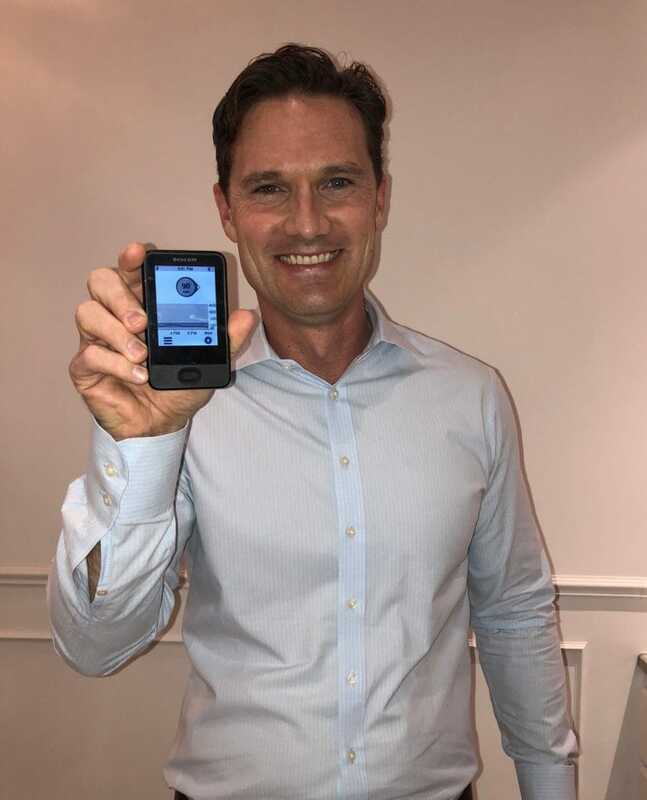 “I think the majority of people with diabetes would benefit from CGM use in order to learn the impact of food, medications, stress and activity on their glucose,” he says, but he does believe education and a great understanding of the technology is vital. 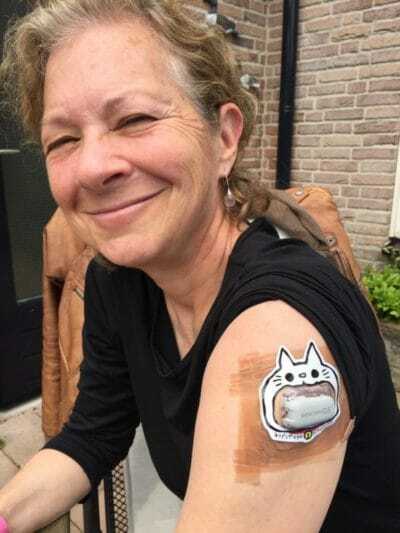 Riva Greenberg, a writer and a global advocate who lives with type 1 diabetes, uses a CGM with the help of her insurance coverage. 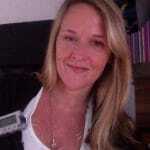 “For me, the CGM gives me invaluable information. I can see my BG every five minutes, and see if it’s fairly stable or going up or down and how quickly. When I take a break in between sessions it’s like I’m missing a part of my body,” she says. For Dexcom CEO, Sayer, CGMs are not just for type 1 diabetes, but also for people with type 2 diabetes on intensive insulin treatment. “If a group came to us to fund a study in an area where type 2 diabetes is very prevalent to learn more, we are very adept at this kind of research. We’ll do it.” CGMs can also be key for people with type 2 diabetes on non-intensive therapy like expensive oral compounds to gauge whether they are working. “A sensor can determine very quickly if a diabetes oral drug is working. We have doctors tell us they found out very quickly with sensor readings that their patients required insulin.” Sensors can also teach people about the effectiveness of other elements of diabetes management. “A person using a CGM can see the value of going for a walk and the value of not eating a big meal right before they go to bed, right on a screen. People cannot get this broad view on their own and certainly not from a finger stick,” says Sayer. I think the majority of people with diabetes would benefit from CGM use in order to learn the impact of food, medications, stress and activity on their glucose. For people with diabetes in wealthier countries, CGMs and insulin pumps are improving outcomes so much that people with diabetes, parents, families and healthcare professionals feel optimistic that the odds for a complication-free life for children and adults with type 1 diabetes are improving. Access is limited however. The insulin pump market is used by approximately one million people worldwide, which is roughly a third of the total number of people living with type 1 diabetes in the US (estimated at three million). For the Medtronic 670G, most users in the US are covered commercially. The one-time cost of the new system ranges anywhere from 6000 to 9000 US dollars but doesn’t include the annual costs for durables and sensors which are in the thousands. The Dexcom CGM is currently used by about 200,000 people in the US and about 70,000 people in international markets primarily by people with type 1 diabetes (only about 10% are used by people with type 2 diabetes, mostly in the US, Sweden and Germany). “Getting reimbursement for technology from countries is key and something we work on nonstop,” says Sayer. Awareness and access to advanced diabetes technology is greatest in North America and after, in Europe, but for most it depends on availability and coverage per country, awareness of diabetes technology, and professional education and training. In low- and middle-income countries, healthcare teams have likely never seen an insulin pump or a CGM, and for people with diabetes, having access to a blood glucose meter and a few test strips is considered advanced. There have been successes. One example is Chile where until 18 months ago there was no access for people with type 1 diabetes – all technology was an out-of-pocket expense. The paediatric endocrinology community and families started a robust campaign aided by professional football star Arturo Vidal, who wears a tattoo of an insulin pump on his abdomen in honour of his son. “The government listened and provided insulin pumps and CGMs to all paediatric patients,” says Galindo. “This was a huge landmark success in Chile, which then becomes a footprint for other countries who may be in the same spot. The outcome worked because people advocated and fought for access.” The hashtag for the campaign is #bombadeinsulinaalauge and the news report in Spanish can be found here. Worldwide, diabetes technology needs an awareness boost. With much of the world poor in diabetes technology access, education is key as well as stakeholder advocacy to ensure that not only the most basic technology (faster, more effective analogue insulins, and SMBG kits including test strips) get to people with diabetes worldwide but also that newer advanced device technology is getting to people with type 1 diabetes, especially for the youngest and most vulnerable. Education and awareness are what truly allow healthcare systems to think and be conscious about perhaps providing broader access. 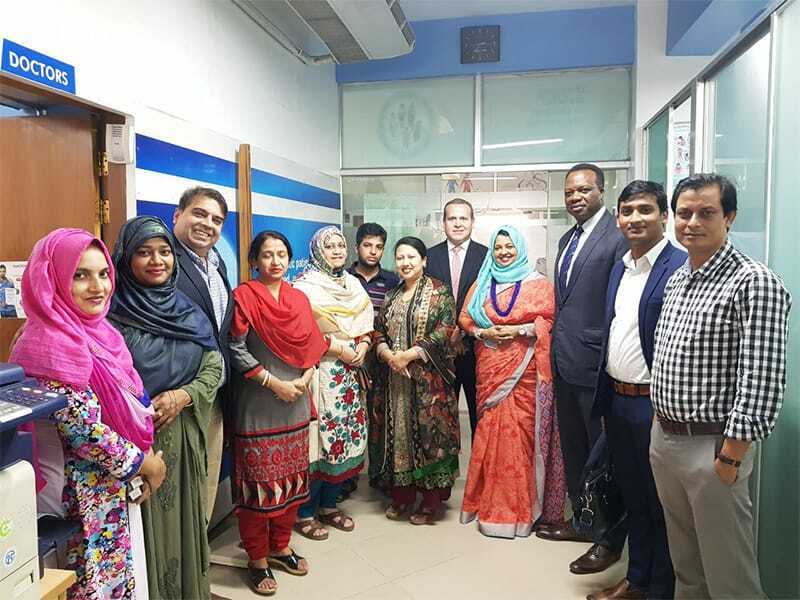 Alejandro Galindo meets with doctors and staff at the world’s largest diabetes hospital, BIRDEM, in Dhaka, Bangladesh.